The concept of customers serving themselves is not new. The first bank ATM was installed as far back as 1967 in Enfield, North London, while deposit-only machines date back to the 30’s. You can now go on holiday without talking to anyone! Book over the internet, check-in online or at a kiosk, drop your bags off and head for security and the shops. Over time more and more daily tasks have been transformed to ‘self-service’. The retail environment was slow to catch-on, but is now making up for lost time. Most large retailers now offer self-service checkouts. Some offer ‘scan as you shop’ using hand scanners or even your own smartphone. Petrol forecourts now offer ‘pay at pump’ service. These technologies are reflections of modern living. They enable the customer to be in control. But these technologies do not come cheap. They are expensive to purchase, require continual monitoring and require frequent support. Retailers are always looking to achieve a maximum return on their investment and to reduce labor cost. The first self-service checkouts were installed in the 1990’s. They are now an everyday part of the shopping experience. It must be remembered that self-service is a customer choice. You cannot force customers to use self-service checkouts, they won’t like that and will shop elsewhere. It took a long time for the technology to be accepted in the US, for instance, where customers were typically used to having their items ‘bagged’ for them. A popular way for retailers to measure the use of self-service is by setting a service metric target. So for example, 30 percent of all transactions should go through the self-service checkouts (SCO) per week. This has merit as a measurement tool, but it does not measure the customer experience. How long a customer waits or how many people are in the queue in front of them are probably more important to their experience. If you give a bad customer experience, then in the long term this will only hurt your target. To ensure maximum use of self-service checkouts you need to have a constant length queue. One or two customers in the queue is optimum. They won’t be there long, assuming there are at least four checkouts. Maintaining that target is not easy. Queues across a store will typically even themselves out. If the main bank is quiet, then you won’t maintain a queue at self-service. The location of the self-service checkouts is also important. 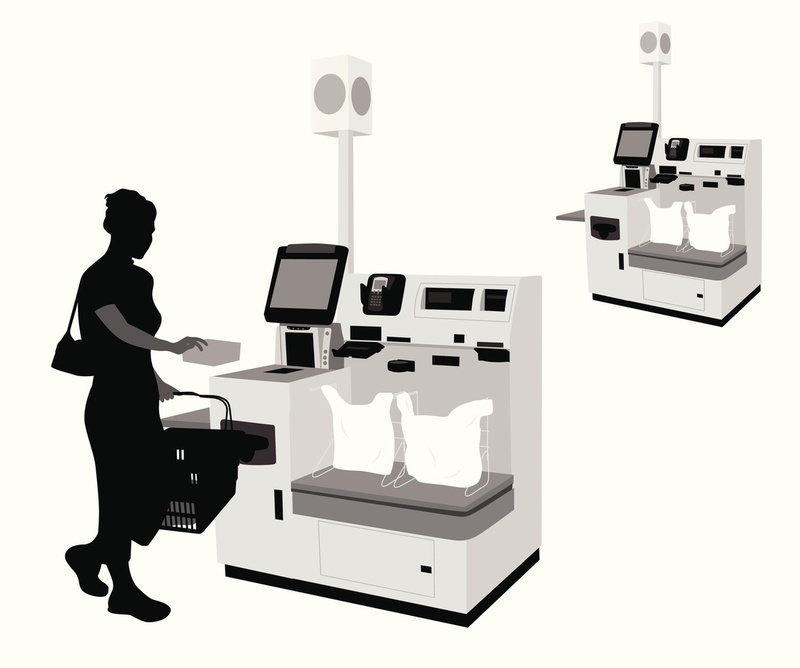 Self-service is primarily designed for the basket shopper. Placing the self-service far from the convenience items like sandwiches will affect use. It is also good practice to place them in similar locations in every store - a shopper who seeks-out the self-service will know where they are located regardless of which store they are in. Another consideration is what type of checkouts are near-by and which ones are open. Putting a ‘basket only’ or ‘10 items or fewer’ lane alongside will reduce the use of self-service. Opened checkouts have an impact also. Don’t leave too big a gap between the self-service and the next opened staffed lane. Customers will not move queues if the next available one is too far away. The quality and type of person staffing the self-service has a big influence on how they perform. Someone in the background, doing the minimum will not help to drive use. Staff who are confident and actively encouraging customer use will project a confident air. Customers who may not normally use them might consider it as this staff member will surely sort out any issues. Then there are the more recent entrants with ‘Scan and Go’ technology. Some have been successful – Tesco, who use the Irisys Queue Management solution, and Sainsbury to name two. Tesco’s new discount brand – Jack’s – has launched a ‘Shop Smart’ app where customers use their own mobile to scan items as they shop and then pay at the checkout. Some have not been so successful - Walmart recently pulled out of their customer scan trial. Kroger, who also use the Irisys Queue Management solution (branded as ‘QueVision’ in their stores) are currently trialing the ‘Scan and Go’ technology with a view to deployment to 400 stores by the end of the year. This type of solution offers yet another service choice for customers. To get the most out of all these technologies requires a cohesive strategy across the whole front end. Knowing what the targets are and having the information to manage to those targets will reap benefits in increased self-service use and reduced cashier expense. The Irisys Queue Management Solution can measure both main-bank and self-service queues, providing the tools and knowledge to manage the environment. It can measure queue length at one service point and customer wait-time at others, like self-service. By combining these measurements into a simple dashboard, staff have the information to manage in real-time. Management reporting provides an enterprise view of the service customers receive. Another benefit is the data a measurement system can provide. It can be used to identify bottlenecks and periods of peak use. This allows a retailer to review the store format. To make decisions on what is the right number of self-service checkouts, for example. Have they got too many staffed lanes for the volume of customers? By using this information to make informed decisions the retailer can maximize their investment in technology whilst maintaining a high level of service, and most importantly, customer choice. For more information on the Irisys Queue Management Solution for convenience stores please see Irisys website (www.irisys.net).